The CIC Trophy has been awarded to the winner of the football competition between Army, Navy, and Air Force since 1972. When no clear cut winner prevails in a particular season, last year's winner retains the trophy for another year. This scenario has played out four times - 1974, 1976, 1980, and 1993. Navy has won the prestigious award 18 times including 10 of the past 14 years. Air Force has taken the trophy home to Colorado Springs 21 times including winning the award 13 of 14 seasons between 1989 and 2002. Army has earned the award six times with the last time in 1996. 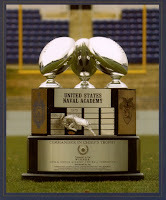 With Army and Navy both defeating Air Force this season, the Army-Navy game on December 9 will decide the CIC winner. The last time the Army-Navy game decided the CIC winner was 2012 when the Mids knocked off the Black Knights, 17-13. This season's CIC head-to-head matchups take place in October, November, and December. Seems more like a schedule for a sports event to be held by the armed forces. Even still, there is no morbidity associated with this post and it is well organized and written. Good work.